Firstly I would like to dedicated this event to my parents. Doing something like this shows you the fighting spirit we as Switala’s have. My mom is currently beating cancer and my endurance on the course is something I have from her and i know she can beat and endure chemo. My dad is soon turning 60 and his support and love for us all is showing and his encouragement is felt. It is good to be back closer to the family again after many years oversea and I enjoy every moment with them. The journey to the race and the execution of it came to the pinnacle on the 30th June 2013 in Klagenfurt Austria. It was a day that was a emotional roller coaster and it had all the elements of emotions compacted into one day and one event. The night before I had calmness. I set 3 alarms; iPhone, iPad and a cheap travel alarm. Experienced in early morning races has taught me well. Get a good night rest and don’t let a stupid thing like “will my alarm go off bother you” I relaxed went through the entire event in my head, with my eyes closed and fell asleep. 4am arrived and all reliable alarms woke me up. I ate my standard oats and honey and went for a 10 minute jog. The best thing ever and I will do it before any event in the future. It does not take away any effort, but it does raise your core temperature and increases your pulse. This avoids a major shock to the system when plunging into the water. Relaxed I packed my stuff and woke up my buddy Tim to take me to the event. I checked all my bags, fitted my bottles and nutrition. Scouted the entire area and headed to the swim start. I met up with Matthias. Got into my wetsuit and felt the excitement rising. Getting onto the beach for the land start with 3000 athletes was awesome and boom went the cannon. The swim start was scary as hell. Fear was definitely an emotion. There was hitting and kicking and plain chaos. I did not get into a good rhythm. A lot of one sided breathing on nearly every stroke. I did plenty of breast stroke trying to sight. I also kept my distance from the buoy not to get caught up in the turmoil. But I did add an extra 100m to my swim according to my watch. Swimming down the canal was cool. Great motivation, but muddy and busy. I was ecstatic to be pulled out. For me the main worry over and I was mentally fist pumping, especially after overshooting my goal time of 1:10 by only two minutes. The best is, I know I can improve here with more confidence and open water experience. The bike ride I can describe short and sweet and will put it all in one word. “WOW”. Now for the extended version. The bike ride was absolutely fantastic. The course was really fast. I was hitting the numbers I was hoping for and even doing fast on the downhills. I kept my cadence nice and high and backed down on the power to prepare for the unknown. There where 3 nice climbs with one that sometimes did not feel it will end. Plus you had to do it twice. I did the 1st lap really fast. Still need to download and look at the results. 2nd lap was slower and I did feel the fatigue getting into my legs a bit. One mistake I did, which was not major was my nutrition. I had saltpills packed, they just never ended on the bike. Not a major issue, but I think a saltstick dispenser is needed to avoid problems in the future. In the end I did a 5:44 bike. Well under 6hours and 14minutes over my goal time. Eventually it did happen. My feet stopped hurting, my running form was fantastic, my pace was good, hips where forward and body posture straight. I was getting into a 5:20 pace and I felt great. I saw Tim, Alma and little Yael a couple of times which just encouraged me to push harder. The crowed and atmosphere was absolutely amazing. I felt great and did a good 1:39 half marathon. And then I hit km 28. I just took some saltpills, had a gel and drank stuff from the aid stations. All the crap to put it lightly was adding up. I tried to calm down and muster it through, but km 30 came and so did all the stuff in my stomach. I did encourage it a bit by sticking my finger down my mouth. Not a dumb move to be honest. I felt better and only sticker to Pepsi and water melons. I did slow down significantly the last bit and walked quite a bit. But when I reached km 38 I decided to open the taps and do a strong finish. At a point I was nailing a 4:38 pace right to the finish line. Putting in all the effort just made the last stretch so much more memorable. I came down then chute, high fived the Morianz family and enjoyed the moment. In the end I did a 4:14 marathon. A bit slow. I was aiming for a 3:20-3:40. But there is always a next time. Final result was 11:23:33. 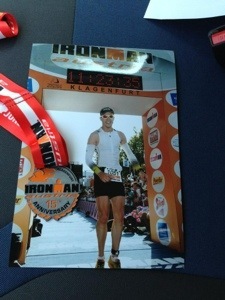 Very happy and proud for a first Ironman. When is the next ……. I did go back to the hotel then for a shower and some shut eye. At 21:00 we went back and the atmosphere was absolutely amazing to encourage and see all the last athletes finishing. The last person came in with still 3 minutes on the clock. Which meant no one was cut off at the final. How awesome is that. What an amazing event and I will definitely do this one again in the future. This entry was posted in Race and tagged ironman, race, triathlon. Bookmark the permalink.